Spring Ring provides an opportunity for ringers to meet, share experiences, have fun, and develop musicianship and ringing skills. This event is sponsored by the Handbell Musicians of America for the benefit of its members. Registration is available only for current members of the Handbell Musicians of America, or members of any ensemble they represent. Individuals, small groups, partial, and complete choirs are all welcome. Join choirs from NH and surrounding states as they come together to ring and build skills. Our clinician, Dan Moore, will guide ringers through the massed ringing pieces in preparation for the upcoming Festival Conference in Hartford, CT. The day will consist of three massed rehearsals, two workshop sessions, and a lunch break, concluding with a concert, open to the public, where we will present the massed pieces along with solo presentations from willing participants! Please see the detailed schedule to the left. Daniel K. Moore of Rumford, RI retired from teaching and directing the Concert Handbell Ringers of the Wheeler School in Providence, RI after 37 years. His auditioned ensemble toured annually, appeared frequently on television, performed with the Rhode Island Philharmonic, and presented opening concerts at national and regional handbell festivals. Recordings include Joy To the World (Empire Brass), Inside Fessiwigs (Ed Sweeney), and on several solo CD’s. 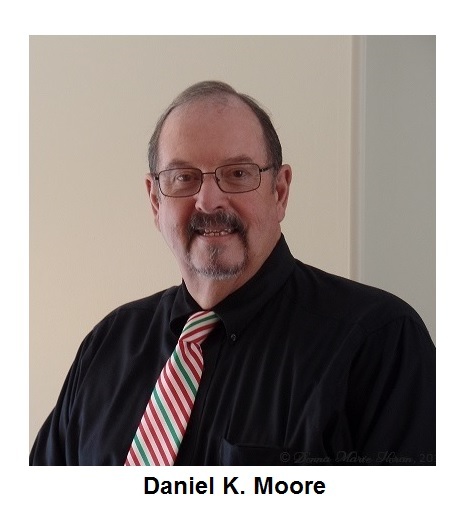 Dan was a charter member of the American Guild of English Handbell Ringer’s committee to promote handbells in education and subsequently served The Area 1 and national AGEHR boards in many capacities, most recently as Chair of AGEHR’s second Certiﬁcation Program, and Secretary of Area 1. Dan is the currently the Artistic Director of the Jubilate Ringers of East Greenwich, RI, and he continues to be a frequent clinician, organizer and conductor at handbell events. His comprehensive handbell textbook, “Ringing RIGHT! From the Beginning”, a valuable resource for ringers and directors alike, is published by HMA/AGEHR. Dan is also a New England regional representative for Malmark Bellcraftsmen. Make Me an Instrument of Thy Peace Kevin McChesney, JHS9296 (Handbells), MJHS9296B (Instrument parts), MJH9296FS (full score), published by Jeffers Handbell Supply, Inc.
Two workshop sessions will be run, one in the morning and one in the afternoon. You will have your choice of two different workshop tracks to participate in, covering both sessions. Participants in the Skill Building Track have their choice of three workshops in each of the two workshop sessions. (ALL) Weaving 101- Carlene Ruesenberg – Here’s your chance to dance around those chromatics! We’ll cover the basics of weaving 3 and 4 (or more) bells. Bring Gloves to this class. Limit 10 participants. (ALL) Drumming and Rhythm-Krishna Ersson Using percussion to improve your rhythm skills, and adding color to your handbell performances. If you have hand drums or other percussion instrument bring them with you to this class. Improve your sight-reading skills with clinician Dan Moore! Dan will use both Workshop sessions to instruct participants on how to approach a new piece of music and make it your own. If you choose this option, you will receive a piece of music when you arrive and work with Dan as you read through it and work on making music from the start. Please note, this is a two-session track. We invite your choir/ensemble to share a “solo” selection during the final concert. Please fill out the appropriate information on the registration form if you wish to perform a solo piece. Solo performances will be limited to the first five requests. You will be assigned a short time during lunch to run through your piece once in the performance area. Please be prompt and courteous to other groups. In order to save on registration costs, and with the many dietary concerns, Lunch will be Bring Your Own. That way you can bring exactly what you want or need. Coffee and water will be provide. Closed water bottles only will be allowed on the ringing floor. If you are planning to ring just the massed selections, you are encouraged to attend with a partial choir of any size. Orphan Ringers are welcome! We will match you up as best we can. Each Ringer should bring gloves and comfortable shoes. Each choir (partial or whole) should bring bells, mallets, foam, table covers, music, music stands, and tables. If your choir has a uniform or concert dress you are encouraged to wear it for the day or the performance. Youth ringers welcome! Please register at least one Adult as a chaperone for every ten registered ringers under the age of 18. If you have a need for some financial assistance in order to attend this event, please apply for the financial assistance scholarship. Directors who are members of the Handbell Musicians of America in Area 1 and have never attended an Area 1 or National event may apply for the Bradford Scholarship for Directors.